The recent defection of Orji Uzor Kalu, former governor of Abia State, from the Progressive Peoples Alliance (PPA) to the ruling All Progressives Congress (APC), has kept tongues wagging on the motive(s), appropriateness or otherwise of it and the timing of such a move. While a lot of people have naturally believed that Kalu took that decision in order to be adorned with the garment of sainthood by the ruling party since he is facing corruption charges by the Economic and Financial Crimes Commission, EFCC, and have his trial truncated, others think it is self-seeking, self-serving and self-redeeming more than any story of regional integration of Ndigbo to Nigeria’s mainstream politics. After all, Timipre Sylva had very damning corruption charges against him in court by the same EFCC, yet, he was the ruling party’s anointed candidate in the last governorship election in Bayelsa State. The late Abubakar Audu also had corruption case bordering on some humongous amounts hanging around his neck for which he was being tried, yet, he was the anointed candidate of the All Progressives Congress, APC, in the last Kogi governorship election. So when people conclude that Orji Kalu ran to APC for cover, and maybe, for canonization, they might not be blamed seeing the trend of events in this regard in the party over time. Not even his own explanation that his family was already in APC and that he had only gone to join where his family is would suffice or assuage his doubters most of who feel betrayed by the defection of someone they had seen as one of the indefatigable fighters for his people. It is even more heart-rending to know that Kalu abandoned the Progressive Peoples Allaince, PPA, a party he himself had formed and nurtured to prominence. What could be the attraction in another man’s house that would make a man abandon the one he labored to build from scratch to finish only for him to leave his family members stranded in it as he himself moves to another even if he would be given just a servant’s quarters to live in there? 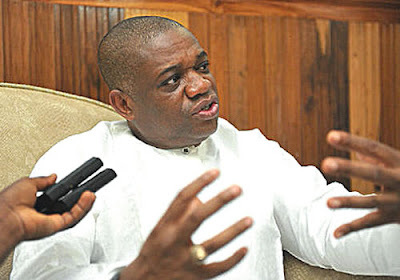 Many think that Kalu’s family members earlier joining the APC was nothing but a premeditated action that would serve as a decoy for him to move over should he feel left drenched in his own PPA, hence, having lost the Abia North Senatorial zone election held on March 28, 2015, and having lost his bid to reclaim via the Election Petition Tribunal what has now become an unpopular mandate, the former Abia State governor can be said to have been left drenched in the rain indeed. Rather than jump ship, one would have thought that Orji Kalu would be gracious enough to deploy his wealth of experience in politics, his now fading clout and dwindling popularity to strengthen his PPA and use it to mentor younger and budding politicians who see him as their hero into maturity. He would have even gone into strategic alliance with other parties of his PPA’s similar capacity to impact more on the nation’s polity. But no, in his desperation, he decided to choose the easy way out for himself, and he chose a party whose leader and president of the country has treated the southeast with so much disdain, with security agents under his watch killing harmless and armless Igbo youth for the simple fact that they attempt to exercise their fundamental human rights to peaceful assembly. This has continued even right under the nose of prominent Igbo sons and daughters in APC including Ogbonnaya Onu, Chris Ngige and Rochas Okorocha. Defecting to such a party is viewed by many as a betrayal of the common cause no matter the reasons advanced for it. Today Mrs Bridget Agbahime, the Imo State indigene that was murdered in cold blood recently by some religious extremists in Kano seems to have died in vain as her suspected murderers have been freed by an APC-led government in manners that seemed to confer on the murderers and murderers-to-be some sort of immunity from prosecution as long as their victims are Igbo, and in a manner that is insulting to the sensibilities of the Igbo nation. It is this same president who had declared the southeast as part of those regions that would receive only 5% government attention in consonance with their voting patterns in the 2015 presidential election, as if democracy is no longer a game of free choice. It is this same party that has treated its own leaders and major stakeholders with so much disdain that the party has so fallen apart the centre can no longer hold. While such leaders and stakeholders are running away from the party, Kalu is plunging himself into it. What can a party with so much chaos offer the southeast in particular and Nigeria at large if not needless violence, economic recession gradually graduating into depression, persecution of political enemies, starvation, intimidation and harassment of citizens etc. A majority of Igbo people did not vote for Buhari in the last presidential election for reasons Buhari is exhibiting today. Even those who voted for him in the north and southwest are now regretting their decision heavily. The Igbo are not known for the character being exhibited by Kalu. They would rather participate in a project that would fail today but succeed tomorrow than the project that would succeed today but fail tomorrow. They do not flinch. It is therefore startling to hear that one of the reasons why Kalu defected to APC is to bring the Igbo to Nigeria’s mainstream politics as if he has crowned himself king of the Igbo whose presence anywhere means the presence of the Igbo nation. It is even more ridiculous to hear that the media mogul promised to deliver the southeast to APC in coming elections. How can this be for a man who only recently lost his senatorial zone election by coming a distant third after PDP’s Mao Ohuabunwa and another even far less popular candidate in the person of David Ogba of APGA? To see APC goons jubilate at this promise requires concerned citizens to call the leadership capacity of that party to question. As it is today, one is not even sure if Orji Kalu would win a local government election in Abia State. To say dismissively that he would deliver the southeast to APC is to brazenly overrate himself and grossly underrate the southeast as a region. The southeast may be the smallest region in Nigeria in terms of land mass, but it should not be ridiculed to the extent that any one man somewhere can think he can just deliver it to any party. Ndigbo are wiser and bigger than that. Anyway, APC caused Nigerians to fall for all their false promises during the campaigns. It seems it is payback time now.